So you want to experience the magic of whitewater but you don’t know where to start? Before you zip up your life jacket and buckle up your helmet for that once-in-a-lifetime trip, here are some important tips. Easily one of our most-asked questions is ‘which trip should I choose?’ And our answer is always, it depends on YOU! Everyone is different. Some people crave adrenaline while others might be afraid to even step near the water, which is totally fine! First consider whether you want to paddle or power raft — both are awesome options! If you can’t decide between the two, why not try both? Then decide the length of your trip — half-day, full-day and multi-day adventures, perfect for every schedule. Kumsheen has them all. For some people, the thought of rafting down a raging river can be scary, terrifying even, and that is totally normal! A whitewater rafting trip is definitely not a float down a lazy river — it’s exhilarating and exciting and 100% worth the excitement. To calm your nerves, pay close attention to the safety talk the guides conduct before each trip. They will prep you for any situation and can answer all your questions. When you are on the river and about to descend into your first rapid, take a deep breath, listen to your guide’s instructions and live in the moment! We promise once you get through the first rapid, you’ll be hooked! Nothing is worse than being uncomfortable and cold on an epic rafting adventure so know what to wear. 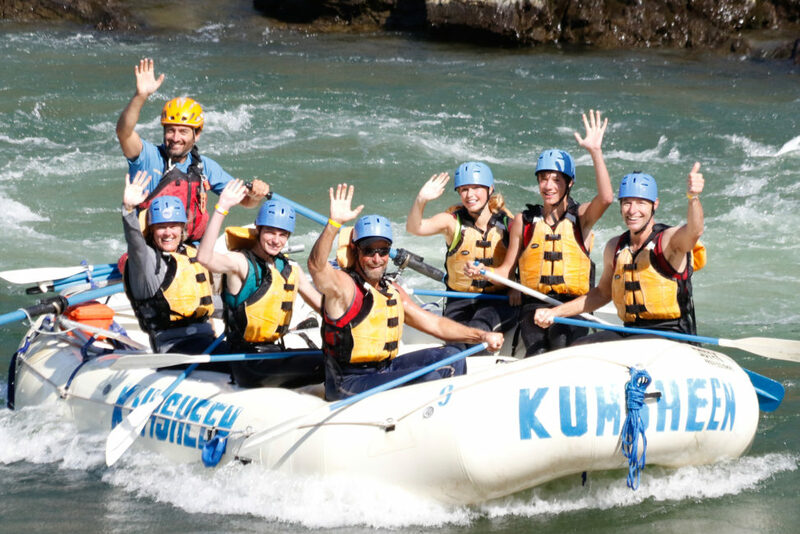 At Kumsheen, we are lucky to raft on the Thompson River which is considerably warmer than many other rivers in British Columbia. But even in the heat of summer, it is still important to dress in quick-drying layers and wear secure footwear like shoes or sandals that won’t fall off! For more a more detailed list of what to wear rafting, which varies by time of year, click here. Your guides are there to give you an incredibly fun experience and to ensure your safety from the time you depart the resort to the time you step off the bus at the end of the day. All our guides are trained and seasoned professionals, having completed Kumsheen’s very own world-class commercial guide school. They know how to read the rapids and maneuver the rafts so you’re in safe hands. We are extremely picky about the guides we hire selecting staff who are not only technically skilled, but also incredibly friendly and fun. But there’s more to our trips than just whitewater rapids. A trip with Kumsheen means taking in the scenery from a whole new perspective — the river. Watch a bald eagle swallowing a fish on the river bank, pass a car wreck from an alleged bank heist, and spot bighorn sheep on the rocky ledges high above the river. While you’re busy taking in the scenery, listen to the entertaining tales of your guide, and have a laugh guessing which stories are fact and which are fiction.